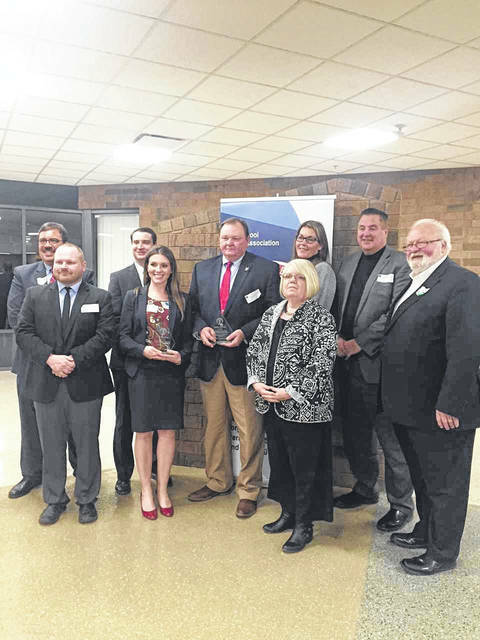 Pictured front row (from left) are Bray M. Shamblin, South Gallia Middle School and High School principal; Morgan Saunders, South Gallia Middle School teacher; Beth James, GCLS board member; Larry Good, OSBA Southeast Region president. Back Row (from left): John Halkias, OSBA president; Nick Owens, State Board of Education District 10; Jeff Fowler, South Gallia High School teacher; Kathy McFarland, OSBA deputy chief; Jude Meyers, GCLS Superintendent. PIKETON — South Gallia Middle School and High School were recently recognized at the Ohio School Boards Association’s Southeast Spring Conference. South Gallia was presented the Ohio Department of Education’s Purple Star Award, given out to military-friendly public schools. Schools receiving this award, show “a major commitment to students and families connected to our nation’s military,” according to a statement from the Ohio School Boards Association. South Gallia hosts the VFW annual fish fry, VFW flag presentations at all varsity home football games, participates in the Veteran’s Day Program at Wal-Mart, hosts an annual Veteran’s Day ceremony and dinner, and participates in FFA flag folding ceremonies at events throughout Gallia County. Across the state, 57 schools received the award and of those 57 schools, five are from the Southeast Region. The Southeast Region is comprised of 18 counties representing 84 school districts.